The following report by Alistair McConnachie appeared in the January 2008 issue of Prosperity. The Eleventh Annual Bromsgrove Conference was held at our usual venue on the weekend of the 5th-7th October 2007 and it proved to be the busiest yet, with 46 attendees, 13 of whom were new faces and many who had not been for years — and included people from Canada, the USA, New Zealand and Italy! 1. To bring people together. 2. To enjoy the benefits of association of like-minds. 3. To develop intellectually our Money Reform policy. 4. To develop plans to promote our Money Reform policy, and fifthly to boost our morale. In short, the Bromsgrove Conference is an opportunity for us to meet, network, discuss issues of vital importance based around reform of the money system, to educate ourselves further, and to develop projects to promote our solutions — within a morale-boosting environment. The theme of the Conference was “The Conquest of Poverty”, a title taken from the 1935 book by GG McGeer. To that end, he said, Money Reformers work to ensure that a major part of the solution to poverty and the rising cost of living is a switch from funding mechanisms based on debt, to funding mechanisms based upon the availability of people, skills and materials. This can most readily be achieved by direct, debt-free, creation of the funds necessary by an independent and accountable public body which will create and supply money to the economy. Some of us advocate that such a public body supplies only some of the money to the economy while others advocate that this body provides the entirety of the money supply. Convenor James Gibb Stuart, recently returned from addressing the American Monetary Institute’s 3rd Annual Conference in Chicago, spoke on some of the points which he had raised at the AMI. Next up, William Krehm, the indefatigable Chairman of the Toronto-based Committee on Monetary and Economic Reform, and Editor of its magazine COMER, commented on the legacy of Canadian politician and Money Reformer GG McGeer whose 1935 magnum opus lent our Conference its theme. Canon Peter Challen opened the main day of the Conference in his usual invigourating and comprehensive style, and put the Conference in its wider context. Simon Moore spoke on “Utilising New Media to Promote Money Reform” and explained how community radio and internet activism, including YouTube video-production — in which he was particularly interested — can help promote the Money Reform message. Conall Boyle spoke to his research which was published in the October 2007 issue of Prosperity — how the Bank of England calculates seigniorage payments to the Treasury. Frank Taylor spoke to his very well-received paper entitled “Financing Public Investment by ‘Carousel'” — a “perpetual motion” mechanism for government’s capital investment programmes. Copies are available from us here at the office. After lunch, Stephen Zarlenga, Director of the American Monetary Institute, took us through a version of his recent speech, “Greening the Dollar — Reclaiming Democratic Values through Monetary Reform”, which he had delivered to the US Green Party National Convention. You can read the interview Alistair McConnachie did with Stephen Zarlenga on the journey to Bromsgrove 2007 at this link. Well known anti-corporate activist and leader of the Canadian Action Party, Connie Fogal, all the way from Vancouver, spoke on the proposed currency for Mexico, USA and Canada — the Amero. 4) restrict the banks’ ability to create money, which only fuels rising prices. Mike Black updated us on the recent meeting of the Bromsgrove Continuity Group in London and the idea of a campaign for a Royal Commission to investigate the Banking System. Finally, before dinner, Stephen Zarlenga showed a long-lost film of one of COMER’s founders John Hotson speaking for 45 minutes to the New Zealand Democratic Party in the early 1990s. This DVD is now available from our office for £5 payable to Prosperity. 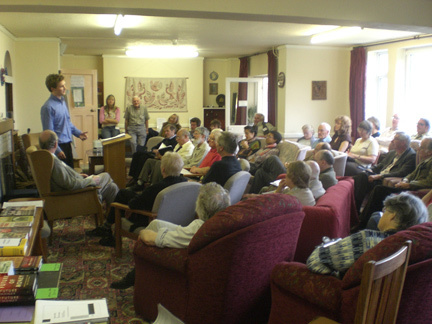 The evening ended with Malcolm Currie proposing that the Bromsgrove Group should participate in an economics debate in the centre of Birmingham sometime in October 2008. The Conference thought this was an excellent idea, so watch this space! Sunday morning began with Marco Della Luna, from Italy, speaking on Complementary Currencies in his homeland. His excellent speech is also available from us here at the office. Ian Greenwood was next up, speaking about his proposals for “a Credit-Money Banking Adjustment.” Jamie Walton from New Zealand presented a report of his money reform-related experiences, observations and impressions in the past year, since Bromsgrove 2006. Finally, a Questions and Answers session with several of the Speakers rounded off the official programme. Our thanks to everyone who came, especially those from so far away, everyone who spoke, and everyone who was able to give lifts to attendees — that was much appreciated. A big “Thank You” especially to Donald Martin for once again chairing most of the sessions in such a professional, exact and fair manner, which ensured the event went as smoothly as it did! Our Twelfth Conference will be on Friday 3rd to Sunday 5th October 2008. Please do make a note of that today, and please do try to be there. Everyone who was there in October will get an automatic invite for 2008, but if you’ve never been before and want to be put on the invite list, please contact us! We can guarantee you will find it a unique and extremely worthwhile event!